We cannot say how pleased we are with the cover to the new book! We are simply thrilled and grateful to Christie Henry, our editor at the University of Chicago Press, and her team for coming up with this fantastic design that really drives home what the book is about–the post-war industrialization of fishing, the explosion of factory processing boats throughout the oceans, and the subsequent decline of fish stocks. We’d also like to thank Karin Ellison and her magic fingers for technical help she gives to the blog. We don’t know who did the art work but we suspect the artist may have been influenced by one of the few online photographs of the Soviet fishing fleet. We’ve used this on our blog before (and, truth be told, probably will again). There really has not been a great deal written about the impact of the Soviet factory trawler fleet in the world’s oceans, despite the magnitude of the impact the fishery had on fish stocks (including our poster fish, Sebastes alutus. The most factual information about the Soviet fishery, especially in the Pacific, is found here on the blog, and on our most important posts, (all by Bob Hitz). It was not just the Soviets that build a huge fleet of factory processors, many nations did, including Japan, Spain, South Korea, Taiwan, Germany, and a host of Eastern European states. Governments provided subsidies to modernize and industrialize, moving fisheries from salting to freezing, and the creation of new fish forms. 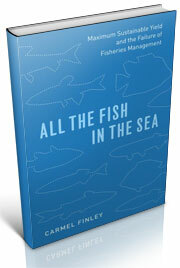 Fishing was great for local economies, but, unfortunately, not so great for local fish stocks. 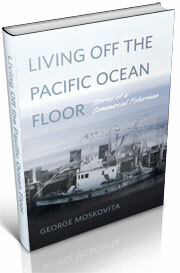 In some ways the new book is a lot like the old book (some characters are back, Wilbert Chapman, Nick Bez, and the world’s largest fish processing vessel, the Pacific Explorer. 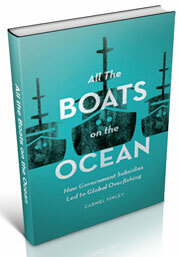 The Cold War is also back with a look at what it meant for fish stocks. The thrust of the book is different. We look at how cod from Iceland and tuna from Japan eroded fisheries in New England and Southern California. The scope of the book is much different, about how fishing acted as a territorial claim in the oceans, at a time when colonial empires were ending on land and being re-created in the ocean. Fishing was one of the first global industries, over the centuries, and the rapid expansion after World War II was driven by trade policy at the national level. So that’s what the new book’s about, how we built so many boats. Out in February. And in the meantime, be warned that we might gush again about our beautiful cover! This entry was posted in boat building, Carmel Finley, Cold War, Environmental History, Fisherie subsidies, Fisheries economics, Fisheries policy, Fishing, History of Science, History of Technology, Japanese fishing, Maritime History, Nick Bez, Ocean fishing, Overfishing, Pacific Fishing History Project, Rosefish, Sebastes rockfish, Soviet environmental history, Soviet fishing, Soviet history', World History. Bookmark the permalink. 2 Responses to Our new cover! One of these days I’m going to make it to NM and talk to you about coming to Newport when you did, that’s the start of the next book.